Fifty cards with ideas for very simple games, songs, action rhymes and other fun things to do with very young babies. 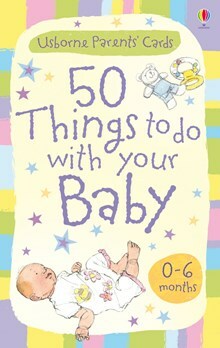 Includes ideas for playing peek-a-boo, using cot mobiles, shaking a rattle and looking at simple pictures on the cards. An inspiring source of inexpensive ideas that help babies learn new skills, find out about the world around them and, most importantly, have fun.